Matryoshka dolls await buyers at a market in Mostar, Bosnia-Herzegovina. The first set of such wooden nesting dolls was made in the late 1890s. 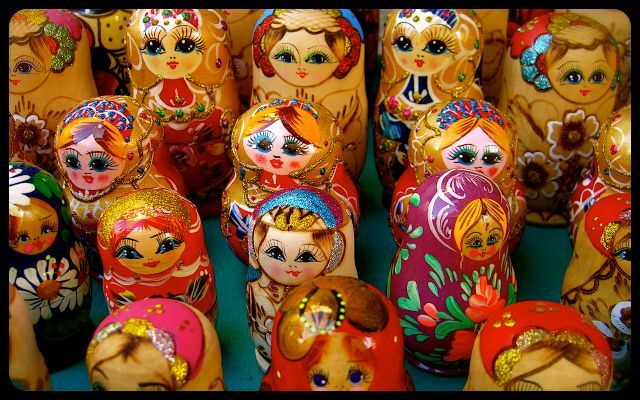 The word matryoshka or матрёшка means ‘little maiden’ in Russian. The designs of the delightful dolls featured above are pretty traditional, however, in countries such as the Czech Republic, Russia and even Bosnia-Herzegovina, politicians’ faces and those of famous athletes are appearing on such figures. What unique faces have you encountered on matryoshka dolls during your travels?